Ever wanted to make your monsters but didn't know where to start? Do your stat blocks' numbers look sketchy? Looking for a little inspiration to spark life into your game? Look no further than between these covers. * A comprehensive list of 600 Special Abilites and Special Qualities taken from the SRD and Monster Geographica: Underground, listing entries as functions of Hit Dice for ease in creature creation. With this tome, delve into the world of creature creation with ease. 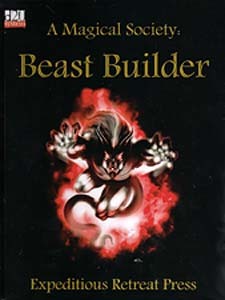 A Magical Society: Beast Builder is the third book in Expeditious Retreat Press' Magical Society Line, a line of books designed to ease world-building endeavours.